This 7-piece Aluminum, Steel and Fully Woven Dining Set by Hampton Bay, offers a classic design with motion chairs for your outdoor patio. Perfect for dining and entertaining, the set includes 6 fully woven bucket dining chairs with arms and rocking motion. The set offers a full-sized dining table with a 4-panel ceramic tile top and a detailed cast center. The two-tone, neutral brown goes well with any decor. The durable, multi-step hand-painted espresso finish aluminum frames are beautiful. This collection will provide outdoor enjoyment for years to come. The Vanessa 5-piece dining set adds distinction to your outdoor space. The frames are crafted of robust powder-coated steel for strength and durability, providing long-lasting enjoyment. A wicker weave finish in matte black with the included thick grey cushions add a touch of chic style to any patio. This dining set is a must-have for summer meals and drinks. Let the scrollwork design of this 9-Piece Dining Set enhance your indoor or outdoor living space. This vintage inspired piece is composed of 8 stationary chairs and one table. Each piece is intricately crafted from high-quality aluminum that is powder-coated to resists rust, heat, and moisture making it the perfect outdoor set to enhance your patio or sunroom. This rust-resistant aluminum set is available in 3 configurations to fit any space. 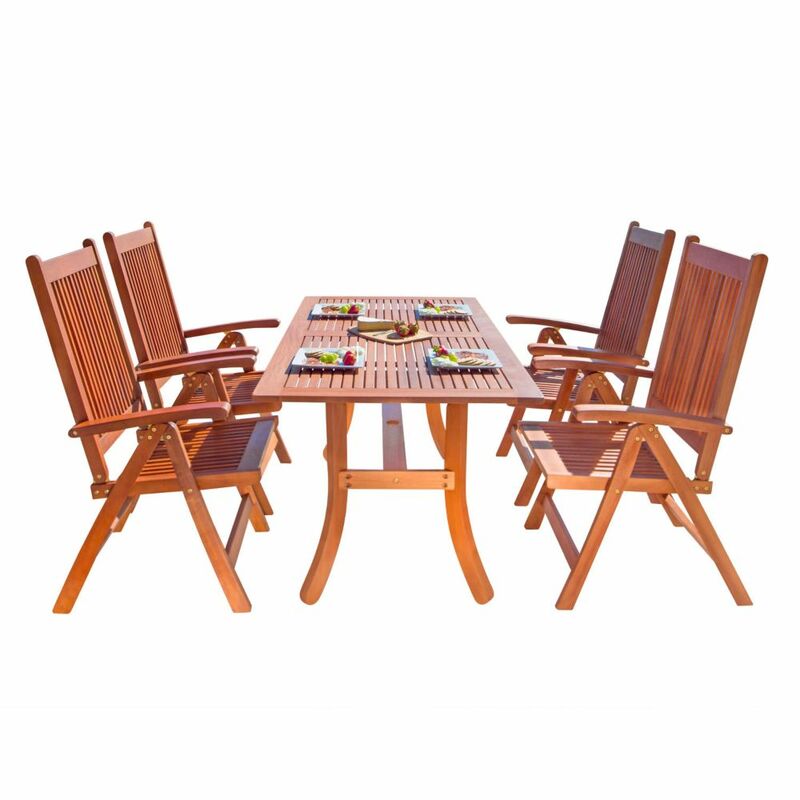 Malibu Outdoor Patio 5-piece Wood Dining Set with Curvy Leg Table and Reclining Chairs Make way for dinner parties, idle summer cocktails, and the optimization of fresh breezes to come with this Malibu Outdoor Patio 5-piece Wood Dining Set! Made from 100% Eucalyptus - a very durable Hardwood, this set that can stand up to all kinds of changes in the weather. The pores of the Eucalyptus is very dense; thereby it quickly repels water, and its natural oil combats and repels wood eating insects. Comes in the beautiful Natural Wood Finish, this set will be a great addition to your outdoor patio!